he Golden Harvest Necklace was inspired by the years I spent gazing out over the terraced, emerald tiers of lush rice paddies. And slowly watching the lush swaying green stalks of turn to gold signaling the approach of a rich harvest. 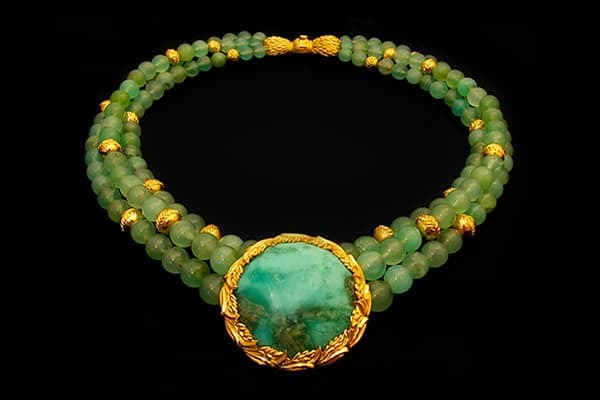 In the Golden Harvest Necklace, you can see that a vibrant green, multi-shade specimen of chrysophase is encircled by twelve bushy heads of golden rice. The watery blanket that covers the rice paddies with a shimmering blanket of rich nutrients, the life giving waters, is represented in the Golden Harvest Necklace, by three translucent strands of green chrysocolla beads. The 22 karat gold beads, interspersed amongst the chrysocolla waters, follow the Fibonacci golden sequence. Each one is decorated with graceful arching heads of golden rice. If you look close, you can see that the clasp of the Golden Harvest Necklace is crafted by repoussé to resemble two bales of padi rice. It took 540 hours to complete this harvest garland in the Zoein Jewels Workshop. The cycles of rice cultivation: of sowing the seed, nurturing it’s growth and harvesting it’s bounty, kept the Balinese close to the living rhythms of nature for over a thousand years. The time of harvest draws the community together, and is considered sacred, a manifestation of the rice padi goddess Dewi Sri. Most of us have lost touch with the cycles of nature that were celebrated and guided the ancient world. 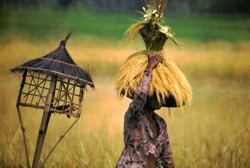 The harvest was the most important time of the year because it insured the survival of the community. Great festivals were held in it’s honor and few of us may realize it, but the Judeo-Christian day of Pentecost was originally a celebration of the wheat harvest in Israel. The Golden Harvest Necklace reminds us of natures bounty and gifts, without which we’d have perished long ago.